Picture this: The Israelites are in the desert, recently having experienced the miraculous Exodus, and are now poised to enter the Promised Land. But first they send out a reconnaissance mission, to assist in formulating a prudent battle strategy. The spies return on the eighth day of Av and report that the land is unconquerable. That night, the 9th of Av, the people cry. They insist that they'd rather go back to Egypt than be slaughtered by the Canaanites. G-d is highly displeased by this public demonstration of distrust in His power, and consequently that generation of Israelites never enters the Holy Land. Only their children have that privilege, after wandering in the desert for another 38 years. 1. The above mentioned episode (in the year 1313 BCE). 2. The destruction of the First Temple in Jerusalem (423 BCE). 3. The destruction of the Second Temple in Jerusalem (69 CE). 4. The conquest of the city of Betar by the Romans. This brought to an end the Bar Kochba rebellion (133 CE). The city was pillaged and hundreds of thousands of Jews were slaughtered. 5. The plowing of the Temple Mount by the Romans, one year after the conquest of Betar. And that's not all. The Jews were expelled from England in 1290 on - you guessed it - Tisha b'Av. In 1492, the Jews were expelled from Spain. King Ferdinand decreed that by the end of July, Spain should be "Judenrein". They were then given two days extra to leave the country, until the second of August, the 9th of Av. The expelled Jews were now susceptible to capture, murder, looting, and wild beasts-both the four-legged and two-legged varieties. Word War I was declared on the 9th of Av in 1914. This war ultimately led to the political and economic upheavals which caused the Bolshevik revolution and the Holocaust. 1. Eat or drink. All adults - even pregnant and nursing women - must fast on this day. Someone who is ill should consult a rabbi. 4. Bathe or wash oneself-"even to insert a finger in cold water." One who becomes soiled may rinse the affected area with cold water. 5. Apply ointment, lotions or creams. 6. Engage in marital relations or any form of intimacy. 7. Greet another with the customary "hello" or "how are you doing?" 8. Engaging in outings, trips or any other pleasurable activities. 9. Study Torah, because "the commandments of the L-rd are upright, causing the heart to rejoice" (Psalms 19:9). It is however permitted - and encouraged - to study sections of the Torah which discuss the destruction of the Temples and the tragedies which befell the Jewish people throughout our history. This prohibition begins at midday of the day before Tisha B'Av. · In the synagogue, the curtain is removed from the Ark and the lights are dimmed. After the evening prayers, Eichah (the Book of Lamentations) is read. The leader reads aloud and the congregation reads along in an undertone. · When ritually washing the hands in the morning, the water should only be poured on the fingers until the knuckle joints. Tuesday night before breaking the fast, one should wash netilat yadayim, this time covering the entire hand with water, but without reciting the blessing. · Tallit and Tefillin are not worn during the morning services. Instead, we don them for Mincha. Tzitzit are worn the entire day. · After Shacharit, it is customary to read the Kinnot (Tisha b'Av elegies). · Work is permitted on Tisha b'Av, but discouraged. On this day one's focus should be on mourning and repentance. If one must work, it should preferably be after midday. · The sections of "Nachem" and "Aneinu" are added to the amidah of the Mincha prayer. Aneinu is only recited by one who is actually fasting. 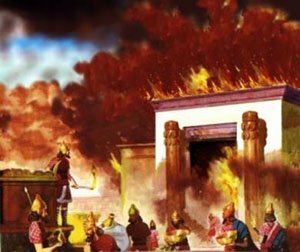 · The Temple was set ablaze on the afternoon of the 9th of Av, and burned through the 10th. Therefore, the restrictions of the Nine Days (such as not eating meat or swimming) extend until midday of Monday, the 11th of Av.